Of Owen Sound, peacefully at Lee Manor on Wednesday, October 15, 2014. 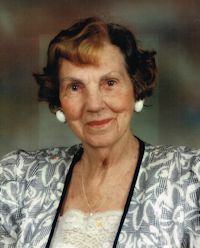 Ruth Linton Stewart (nee Jarrett) in her 101st year. Loving mother of Sandra and her husband Paul Kadlick, of Burlington, and John and his wife Judy, of Wiarton. Cherished grandmother of Mark Hall and his wife Mona, and Lisa McKenzie and her partner Mike; and great-grandmother of Jessica and James McKenzie. Sadly missed by her nieces and nephews. Predeceased by her mother Annie; husband Alex Stewart (1995); brother Gordon Jarrett; sister Margaret Gardiner; and daughter Heather Stewart (1973). Friends may call at the Thomas C. Whitcroft Funeral Home & Chapel, 814 Bruce Rd. 8, Sauble Beach (519) 422-0041 on Thursday, October 16, 2014 from 7-9 PM, where a service to celebrate Ruth’s life will be conducted from the chapel on Friday afternoon at 2 o’clock. Visiting one hour prior to service. Interment in Zion Cemetery, Hepworth. Donations to St. John’s United Church, Wiarton would be greatly appreciated.